Sunday: I remain downhearted about the state of M’s engagement with the guitar, but we ended the day better than we started it. I suppose this is normal. But something about her tone, in light of the past few days, socked me in the stomach. As it happens, that was fine schedule-wise, so she kept on playing for a while. I decided that we’d need to practice at 2, from about 2 to 3. We got off to a (perhaps needlessly) rocky start. M wanted to earn two more Squinky hostages, and I suggested she bring in to our practice room the tea set she was playing with when I started tuning. She gave me two teacups, one for each of the two Squinkies she could earn. She did a nice job calming down, and we proceeded with my plan for our lesson. Our focus is the Bach Tanz, which she butchered at her private lesson yesterday. So we started by going over her story. First, we looked at the whole picture and talked about the song sections. Then, we sang the melody and followed along with the picture. The first time through, M jumped from the C picture to the D picture in the middle of the C section — that is, she prematurely thought that the C section was over. She noticed the mistake when the song kept going. We discussed the problem and sang it again, with the picture, this time correctly. Next, M played through once. She almost skipped the first repeat — that is, she almost played A-B-C, not A-B-A — but she caught herself, played through her mistake, and got back on track. When she was done, we listened to her recording along with the sheet music. She noticed her major mistake and some minor ones (e.g., lots of string noise when shifting positions), and she had a good, open attitude about our approach. 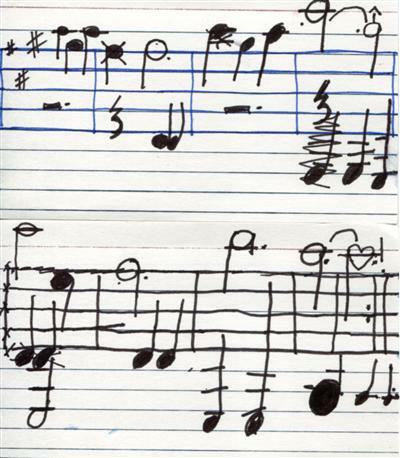 We did this three more times — play & record, then review together with the sheet music. Each time, she got a little bit better, and she did not make any major structural mistakes at any point. My single biggest goal right now is to get M to take ownership of her playing — to care about it. And today, at least, it seemed to happen, at least a little bit.